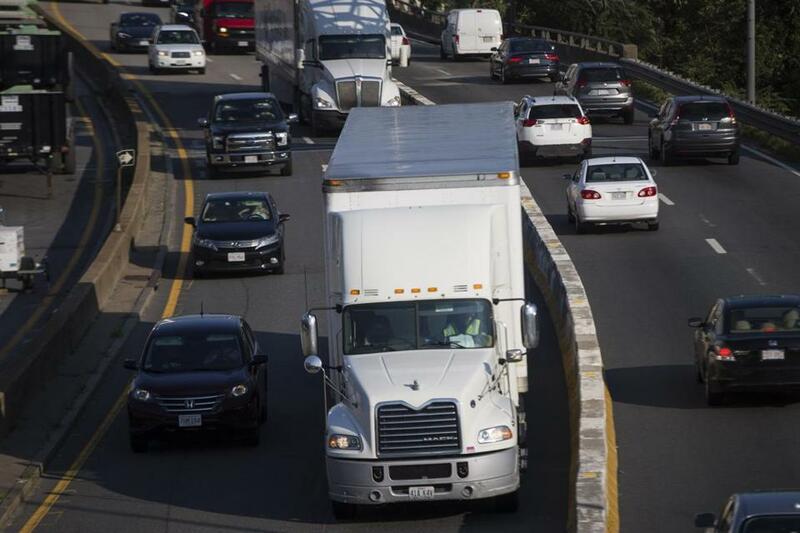 Traffic was heavy Tuesday on the Massachusetts Turnpike, in the area of the Commonwealth Avenue bridge and the accompanying lane reductions. Hey Mass. Pike drivers, your colleagues in car-dom have little sympathy for your current congestion challenge. On I-93, epic backups are a fact of everyday life. “It’s always a mess,” said Justin Varricchione, whose daily commute to Boston from Lakeville can take as much as two hours. The state government created an extensive early-warning system to prepare drivers for disruptions caused by the replacement of the Commonwealth Avenue bridge over the Massachusetts Turnpke in Boston. Even in the best of times, driving into Boston on the turnpike isn’t a breeze. But the section of Interstate 93 from Randolph into Boston has the ignominious distinction of being the fourth-worst traffic corridor in the country, according to INRIX, a traffic-tracking software company. Legends abound about that short commute taking an hour. With the westbound turnpike at half-capacity this week, the seven-mile trip through Boston took 32 minutes Tuesday afternoon, compared to 26 minutes on I-93 for the seven-mile stretch south to Braintree. Turnpike drivers, of course, pay tolls. The state said it could not provide data comparing congestion on the two highways during normal traffic conditions. In recent years, parts of the expressway have hosted, on average, more than 200,000 daily trips through Boston, while the turnpike has peaked at around 160,000. Construction-related backups on the turnpike have been less hellish than expected, because commuters have apparently heeded the warnings to use public transit or stay home, said Jonathan Gulliver, the state’s acting highway administrator. Turnpike traffic on Monday was about 30 percent below normal, but it increased on Tuesday and the highway was more congested as a result, Gulliver said. Backups are starting earlier in the commute and extending farther out, across the Newton line. Yet once drivers merge into the reduced lanes, the going is much smoother, according to Neil Boudreau, a state traffic engineer. “We’re creating bottleneck points. Once traffic gets into the actual constrained area, the two lanes each direction during the day and one lane at night, it’s actually moving fine,” Boudreau said Tuesday. That’s different from the perpetual backups on I-93, Boudreau said, where “you’re kind of in a rolling traffic queue for quite a distance,” because of major traffic junctures in Braintree, to the south of the city, and in Woburn, to the north. Dempsey said that slow commutes everywhere cut into worker productivity and worsen pollution, and that the state should consider additional policies to better manage such problems. The state has generally tried to encourage commuters to use public transportation. Gulliver stressed that better-than-expected turnpike traffic flow should not encourage drivers to return to the road, since that would just add to the congestion. The state estimates that if every regular Pike commuter drove in this week, it would have added up to 90 minutes to all trips. Meanwhile, officials are preparing for a major lane shift during the construction project, moving all traffic to the westbound side so workers can demolish another section of bridge. That shift is likely to occur Thursday, Gulliver said. Overall, the bridge replacement is on schedule, with additional lanes scheduled to reopen Aug 7. The closed sections of Comm. Ave. and the Green Line’s B branch are scheduled to reopen Aug. 14. Adam Vaccaro can be reached at adam.vaccaro@globe.com. Follow him on Twitter @adamtvaccaro. Emily Sweeney can be reached at esweeney@globe.com. Follow her on Twitter @emilysweeney.